The bald eagles that we think nested in the wetlands down below the pond last summer are gone. From spring into fall, they’d glide the length of the pond, thirty feet up, with nary a wing flap. Their presence would invariably be announced with full-throated warnings from the loons, who’d quickly swim over to their chick to keep it from becoming an eagle snack. Late in the summer a gawky eaglet spent several afternoons hanging out on snags and high branches around the pond, driving poor papa loon, uh, loony. And then the eagles were gone. 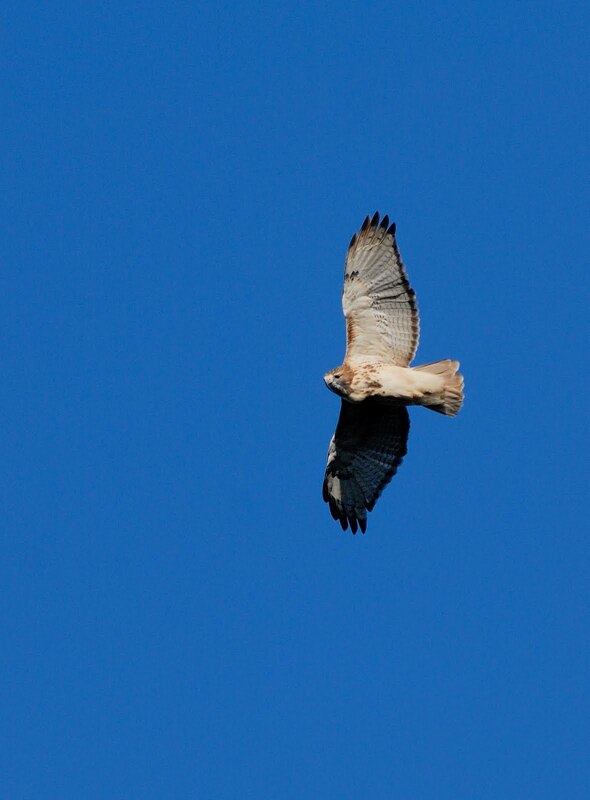 We no longer see hawks rising with the warm air, either. But in other places along the East Coast through the end of November and even into December, you can still watch hawks, eagles, and other raptors making their fall migration. Some raptors will travel as far as Central or South America for the winter. Raptors ride the airborne currents, and so are often funneled into well-traveled flight paths that follow dependable, geography-produced thermals of warm, rising air. Raptors use their keen eyesight to follow landmarks, such as the Appalachian Mountains, as they travel south. 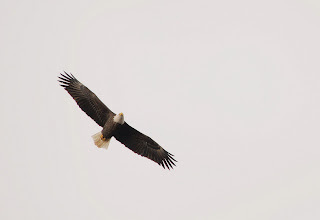 Bald eagles often follow the Delaware River valley system. The two or three days following the passage of a cold front, if the wind is blowing steadily from the north or northeast, are often prime times to catch hawks and eagles in flight. An official hawk counter is on duty every day through the end of November at Cape May, New Jersey. November is the best month to catch golden eagles, which migrate later than bald eagles, passing by Hawk Mountain, Pennsylvania. Two lists of places to see migrating raptors in “Raptor Migrations” (AMC Outdoors, October 2007) and “Hawk Migrations” (Yankee magazine, September 2009). Photos: Sharp-shinned hawk, bald eagle. Taken by Bill Moses during the 2010 fall migration at Hawk Mountain.